Language is plagued by doublespeak, intentional ambiguity, and other badish example thingies. 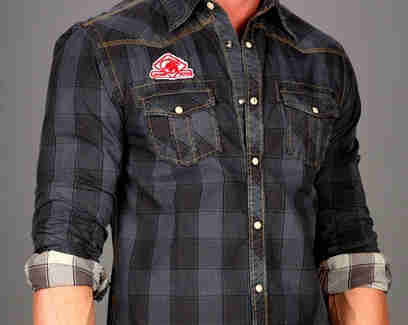 For gear that's not, snag Just A Cheap Shirt. 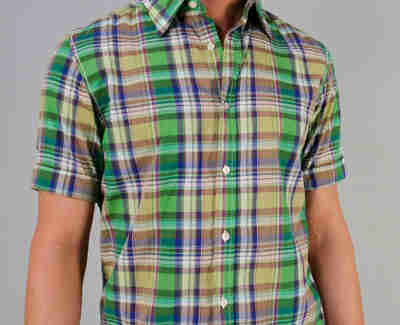 Clearly unafraid to mince words, this less expensive younger sibling to Shirt by Shirt offers a repertoire of multi-colored smart casual torso shields that blends a vintage Americana feel with a dash of military inspiration, which previously had just consisted of listening to a lot of Drowning Pool. 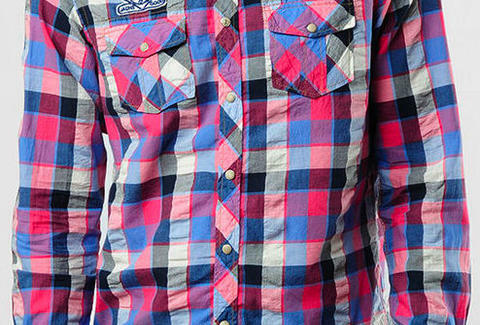 Highlights include a cotton long sleeve w/ snap breast pockets in a bold pink/blue/gray plaid colorway called Rainbow Ice Cream; the khaki Frank with button tabbed rollup short sleeves and a red breast patch that reads "Have a Good Day", and a chambray woven long sleeve with red/blue double cuffs, which'll help you snag twice as many cougars, especially if you go after work on a Thursday. 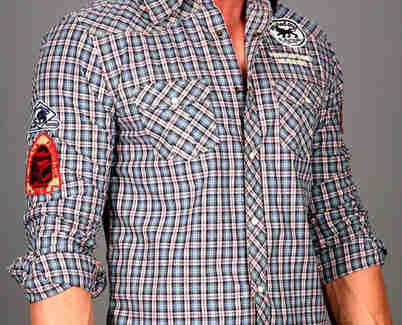 There's also a slim fitting, green/beige plaid longsleeve w/ Western-style yoked and snap-flap chest pockets/front closure; and the blue checkered button-up with military/boy scout-esque arrowhead fishing club patch, which doesn't technically break the whole "first rule of fishing club is not talking about fishing club" deal, but still, it's cutting it close. If you need to go classy, J.A.C.H.S also peddles a more dressy thin blue-striped oxford w/ white spread collar, and a green/beige short sleeve w/ detail contrast embroidery stitching called the Stiff, though it's best to be intentionally ambiguous about that, at least until after you exits Cuffs.